This sewing set is a collaboration finishing design with my friend Marinella Paoletti, alias Mingiustitch, who has designed a similar set, with another stitched design, but the same finishing process. We both used Stitches and Spice threads and fabric and we both enjoyed the lovely creations of Naomi, the owner and artist of Stitches and Spice. 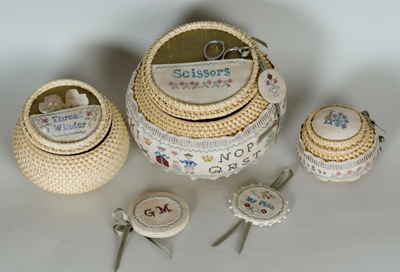 We have used a three baskets set from IKEA to create a complete sewing companion with scissors pocket, thread winder pocket, pincushion, needlebook, scissors fob, pinkeep. You will have a lot of fun in stitching this model !!! Baskets with lid: FRYKEN, set of 3, available from IKEA. For this special piece, we commissioned six Floral pins and a wonderful Cameo Floral waxer. Needle: size 26/28 tapestry needle. List of finishing materials to purchase: Skirtex, interfacing, Iron On Adhesive, quilt cotton batting, small amount of polyfill, sage-green or golden-green silk fabric, sage-green and ecru sewing polyester thread, ecru wool felt, sage-green polyester ribbon ¼ in / 6 mm wide, acid free stick glue, hot glue gun, Wood glue or Tacky Glue. 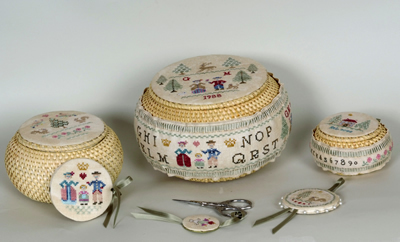 Stitches Cross stitch over two and over one, Back stitch over two and over one, French Knot, Nun’s stitch, Sofia’s Stitch, Smyrna Stitch, Round Rhodes Stitch, Star or Diamond Stitch, Hemstitch.